Give someone the gift they can benefit from all year long. Contact us now for holiday gift certificates. A favorite holiday tradition of mine is watching the 1946 classic, It's a Wonderful Life. After almost giving up in despair over a savings and loan shortage that's not his fault, George Bailey thinks the only solution is to take his life by jumping off a bridge. He's rescued by a guardian angel who shows him what things would have been like if he had never been born. Through a series of events, George discovers he is an incredibly rich man in the things that really matter. He realizes just how wonderful his life has been and how blessed he is. My hope and prayer is that you, too, will take the time during the holiday season to recognize the value of your life and the lives you touch. Search for the sacred in the ordinary events of your life and discover it's a wonderful life ... exactly where you are at this moment. I know what you're thinking: I can't believe it's already November and the holidays are right around the corner. The good news is that with a little advance planning, AKA organization, this time of the year can actually be fun and relatively stress-free. Before things get hectic, hold a family meeting and talk about what is most important to each family member. Ask each person to name one activity or event they would like to do during the holidays to make it extra special. Then be sure to write it on a planning calendar so it's not forgotten. Make a commitment that everything else is secondary. Your children will always remember spending time with you baking homemade cookies and feeling loved and special long after most holiday parties are forgotten. Set up a "Gift Ideas" file and jot down ideas or drop in pages from catalogs throughout the year. If you're really organized, you could even have a form and list each person's name, gift idea, where to purchase, the occasion, and date needed. Then when it's time to shop, all you have to do is pull out your file and half the work is done. Clutter-free ideas for gifts include giving an actual experience - something they love doing - rather than something to unwrap. Gift certificates for restaurants, events, a massage, or even chores are also appreciated by most people. As a professional organizer, I'm inside a lot of homes and one thing I often see is that most people have far more belongings than they could ever use. One client has given her friends and family strict orders not to buy her any more gifts to clutter up her home. Instead, she provides them with a list of her favorite charities and asks that they donate a monetary gift in her name rather buying her something she neither needs nor wants. So if you're one of those people who doesn't need anything, this could be a great idea to pass along to your family and friends. If you enjoy putting up a lot of holiday decorations but have trouble remembering from year to year where they go, take pictures of your handiwork. Simply store the photos with your holiday decorations and the next time you put them up, refer to the pictures and save yourself a bundle of time. Instead, spend the time sipping hot chocolate with marshmallows, taking a relaxing bubble bath by candlelight, or snuggling with your significant other in front of the fireplace. Unless you get an adrenaline high from stress or have an extremely good memory, you're going to have to make lists to stay on track. Plan for the holidays just like you would any other event. Start by making notes in a planner, spiral notebook or on your computer. Have lists for various categories such as special meals, gifts to buy, cards to send, errands to run, etc. 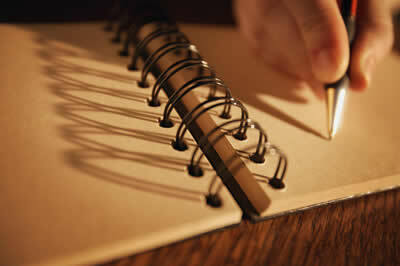 Write out a TO DO list each day with a manageable number of tasks and begin early. Tackling the holidays in bite size chunks is much easier than trying to do it all in a short period of time. Even though you may be tempted to think you can do it all with a smile, realize that you're only human and ask for help. Involve your family in decorating the house, writing out cards and running errands. Bribe them with chocolate if you have to. Hire a babysitter to watch the kids while you make appetizers or wrap gifts, or barter with a neighbor to watch each other's kids when shopping for gifts. When you're tossing, be sure to check for items that can be recycled. Green is good. What gives you joy? Time with your family? Gardening? Hiking? Reading a good book and discussing it with friends? Schedule time for these things on your calendar - make them a priority! Make time each day for something you enjoy. It can be small - a walk, a quiet cup of tea, reading the paper - but make your "me time" sacred and don't let anything interrupt you. Create a Rewards List. If you're not sure what really makes you happy, make a list. What would you do with a few free minutes? An hour? An entire day? Then start to make these rewards a part of your schedule - you can actively pursue happiness! Just in time for the Thanksgiving leftovers! It's frugal to keep leftovers, but only if you use them! Check for expiration dates and toss anything that's past its prime. Do you really need to shop 'til you drop the day after Thanksgiving or do you do it because it's expected? Is your holiday shopping about meeting a spending standard, or giving truly meaningful gifts to family and friends? Create a budget and stick to it. Knowing what you'll spend takes a lot of the stress out of holiday buying. Reduce the number of gifts or the amount you plan to spend on each one to keep your spending in line with your budget. Consider hand-made gifts. Delicious holiday treats and and lovingly-created crafts are a personal way to share the holiday spirit with family and friends. Boxing Day traditionally is a time to donate to those less fortunate. Particularly after the holidays, take some time to pass on items you no longer need or use. This is a great opportunity to teach children the joy of giving, as well as letting go of things they don't use or toys they no longer play with. Find a local charity for your donations (many will even pick them up!) and reap the double benefit of cleaning out the clutter while helping someone in need. You don't have to wait for the New Year - start setting your goals a day early. New Year's resolutions like "get organized" are vague and, let's be honest, can be hard to get excited about. Your real goal may be to have more time to have more time for yourself, more fun with your family, or a commitment to exercise and healthy eating. Being more organized is just the vehicle to help you get there. Once you have a clear objective that you're passionate about, it's easier to tackle the steps to reach it. Keeping a spirit-filled, positive approach to the holiday season will make it a joyful time for you and those you share it with.